The Professor Jayashankar Telangana State Agricultural University (formerly part of Acharya N.G. Ranga Agricultural University) established during 2014 is responsible for education, research and extension in Agriculture and allied fields in the state of Telangana State. The University imparts instructions leading to the Master’s and Doctoral degree courses in Agriculture, Home Science and Agricultural Engineering & Technology and allied fields at its constituent Colleges at Rajendra¬nagar, Jagtial, Hyderabad. For admission into M.Sc. level courses, candidates of TS. who possessing Bachelor Degrees in the concerned fields accredited by ICAR only are eligible. Candidates from other states should seek admission into M.Sc. and Ph.D. courses through the all India Examination conducted by the Indian Council of Agricultural Research (ICAR), New Delhi. Agronomy, Agricultural Economics, Entomology, Agril. Extension, Genetics & Plant Breeding, Plant Pathology, Crop Physiology, Soil Science, Microbiology, Molecular Biology & Biotechnology. Foods & Nutrition, Human Development & Family Studies, Family Resource Management Textile & Apparel Designing and Home Science Extension and Communication Management. Soil & Water Engineering, Processing & Food Engineering and Farm Machinery & Power. 1. Master’s Degree in the concerned faculty and major field with a minimum of 50% marks in traditional system or OGPA of 7.50/10.00 OR 3.25/4.00. SC/ST candidates with a pass in traditional system or OGPA of 7.00/10.00 or 3.00/4.00 are eligible. 2. Basic Degree i.e. B.Sc.(Ag.) / B.Sc. (Home Science) / B.Tech.(Ag. Engg.) of 4 years duration as the case may be is essential. 3. The candidates should have submitted the M.Sc. level thesis on or before the last date prescribed for the receipt of applications and must complete the thesis final viva voce examination successfully as on the date of registration in case of selected candidates. MBA Agri-Business Management B.Sc. (Ag. ) / Hort. / B.Tech. (Ag.Engg.) or B.V.Sc. & AH / B.F.Sc. / B.H.Sc. / B.H.Sc. (Rural) B.Sc. .(H. Sc.) / B.Tech (Dairying) / B.Tech (Food Technology) / B.Sc. (Food Science & Technology) / B.Sc.(Hons.) Food Science & Nutrition / B.Sc. (CA&BM) of 4 years duration. 1. In M.B.A. (Agribusiness Management) course 10% ( 5 Seats) are reserved for NRIs / Industry Sponsored Candidates. 5% of the seats shall be provided to NRIs / and 5% to Industry sponsored candidates. If candidates of one category are not available they shall be allotted to the other category. 2. NRIs should have studied relevant bachelor degree programme prescribed against the course abroad. For Industry Quota the candidates should possess the qualifications prescribed above and also two years relevant experience in Agri. Business Sector. They should be sponsored by the Industry / Organization. 3. The candidates under NRI / Industry quota need not appear for entrance test. They shall be selected based on merit. They should indicate NRI / Industry Quota on the top of the first page of the application Minimum Marks / OGPA required at qualifying examination for admission into M.Sc. level courses: In traditional system 50% marks or an OGPA of 5.50 / 10.00 or 2.50 / 4.00. (for SC/ST categories 40% marks in traditional system or OGPA of 5.00 / 10.00 or 2.00/4.00). The candidates completing their graduation requirements during the year 2015-16 should submit course completion certificate issued by the Associate Dean of the concerned college. Note: For Un–reserved seats (15%) the candidates have to write the examination at any of the centers at Bapatla / Tirupati. However, the candidates shall note that the admissions will be made as per the relevant Government orders applicable at the time of admissions. Payment of stipend is subject to the guidelines issued by the Government from time to time. Applications and prospectus are available in our website:www.pjtsau.ac.in. Separate application should be submitted for each course alongwith the copies of certificates and the Registration Fee. Filled in application should accompany registration fee in the form of DD for Rs.1325/- for General and Rs.725/- for SC, ST & PH categories (M.Sc. / Ph.D. courses) for each course. The Demand Draft should be from SBH / SBI / ANDHRA BANK and drawn in favour of The Registrar, PJTSAU, Rajendranagar, Hyderabad-500 030. (Postal orders / Money orders will not be accepted). Applications for all courses duly filled in including those sent through Employers should reach “The Registrar, PJTSAU, Rajendranagar, Hyderabad-500 030 on or before 15-06-2017 by 4.00 PM. Postal delays will not be condoned. M.Sc. (Ag.) In-service candidates may send advance copies of applications alongwith certificates so as to reach on or before the above date to save delay in forwarding applications by the employers. 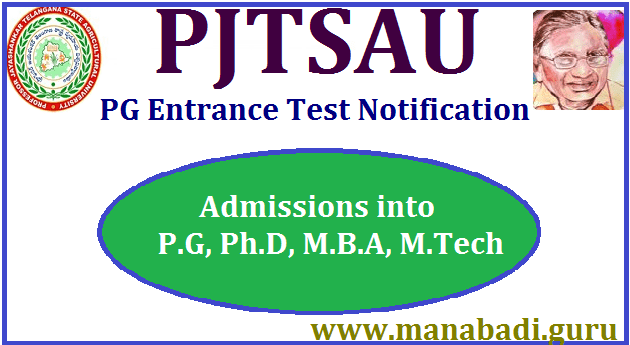 Tags: PJTSAU PG PhD admissions Notification 2017, TS Agriculture PG Entrance Exams 2017, PJTSAU Ph.D, M.Sc, MBA, M.Tech Entrance Test 2017 Notification, PJTSAU PG Admission Notification 2017-18 Notification, PJTSAU PG #AgriCET 2017, PJTSAU PG Admission Schedule 2017-18, M.Sc Level Ph.D Level Application Forms for PJTSAU PG Admissions 2017.